Yesterday, was a great day of fishing. Nymphing in the morning - dry flies in the afternoon. 24 feesh - 4 cutties, 2 brown trout, 15 cutbows, and 3 mountain whitefish. That being said, the day could have taken a turn for the worse (or is it worst) before I had a chance to fish at all. After driving the hour and a half from Missoula to upper Rock Creek, I was excited to get out on the stream. Prior to entering the river I had done a once over to check out any potential dangers. The coast seemed to be clear. So, with the composure of a seven-year old at a toy store, I bounded into the river, rod in hand. I made it halfway across the river when I saw a lady bullwinkle about 20 yards away staring straight through me. 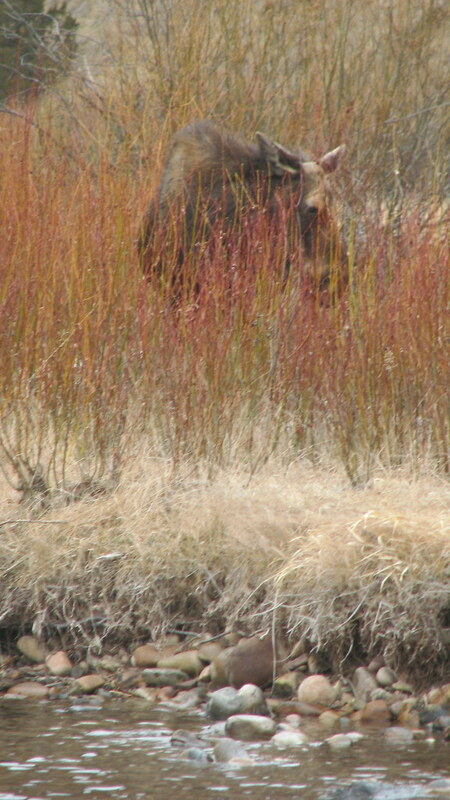 Standing in a patch of riparian veg, the lady moose was frozen still. I, too, was frozen...for about a second. Once I realized what I was staring at, I quickly waded backwards towards my car and the safety of the opposite bank. On the opposite bank, I most likely blessed the world with a couple profanities and promptly whipped out my camera to take a couple pictures of the majestic lady moose. She seemed to pose for a bit, lost interest and then got back to breakfast. Having heard many stories of moose and their aggressive behavior towards intruders, I am thankful that my moose encounter was bland. Luckily the moose was 1) a lady and 2) was not with child. Either one of those options may have changed the story a little bit. After my encounter, I fished upstream of the moose for about a hour, keeping a watchful eye on the cow. I caught two whitefish on a size 10 black stonefly nymph and a san juan worm. 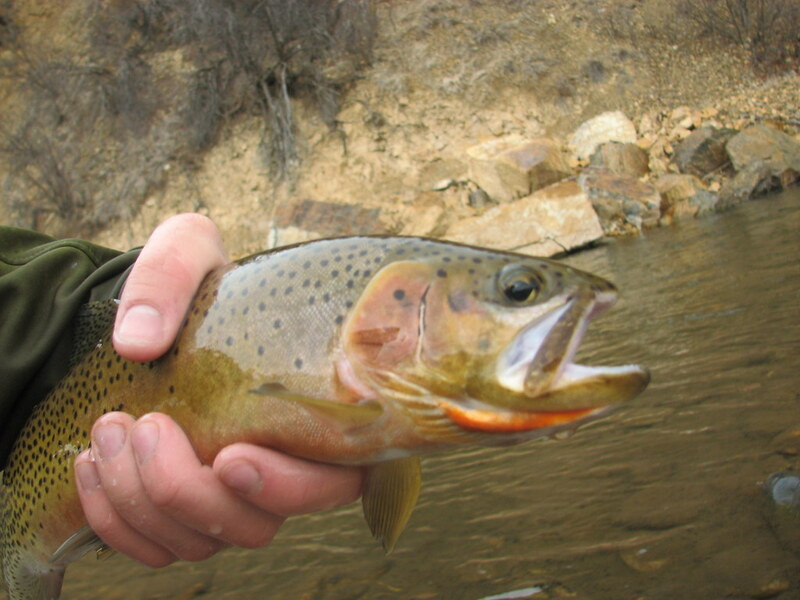 I moved upstream and caught a couple cutbows, a cutthroat, and a whitefish on the stonefly nymph. With water temps rising into the early afternoon, I saw a great deal of surface activity. I originally put on a midge dry (griffith's gnat to be exact - which is an extremely small fly). Not being able to see the fly and its location on the surface, I put on a skwala stonefly dry on with a griffith's gnat trailing the skwala by about 8 inches. 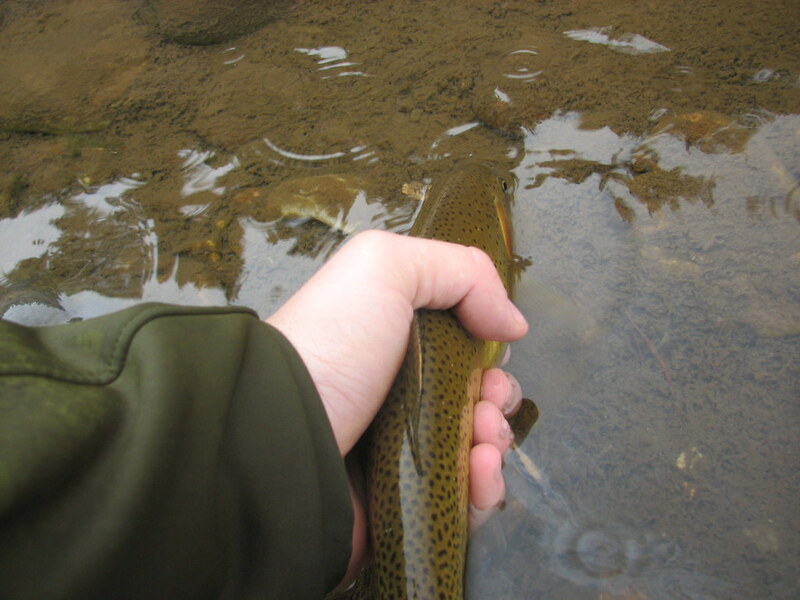 This worked quite well as I was able to cast, in rhythm to rising trout. 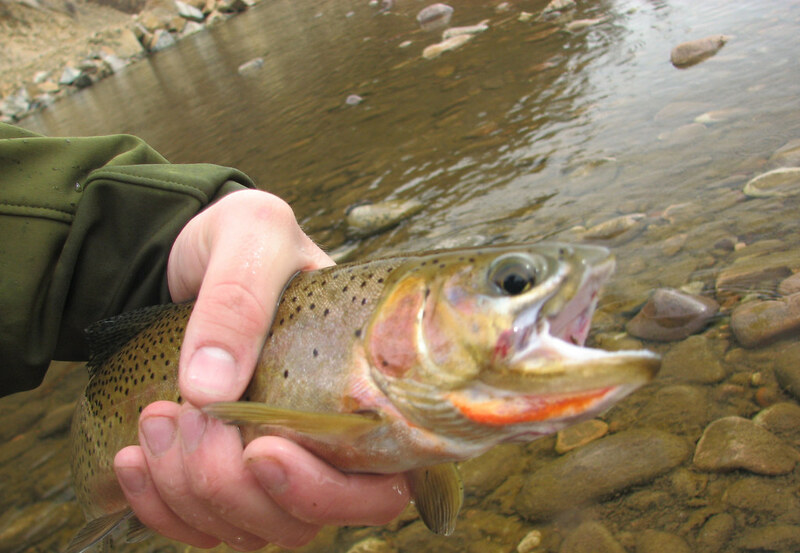 The majority of the fish I caught were cutbows, but I was lucky enough to catch a 15 to 16'' cutthroat. While everything seemed to go well, there was one slip-up. I lost the incredible hulk of fish. Most likely a brown, the monster took a size 22 griffith's gnat and fought an amazing fight, only to slip off as it sat in the main current. Otherwise, it was a fantastic day. Enjoy the pictures and video from my great day on upper rock creek. rock creek 3-29 from Ivan Orsic on Vimeo. It's good you didn't look like a Bull Moose to her. It's rutting/mating/Hey! Winter is Over! season for them, right? mating comes later in the year...late summer/early fall if i am not mistaken. babies are coming soon - may/june i believe.